Video Professor continues to be angry that I called them a scam in my original Scamville post. They’ve gotten nowhere reaching out to me directly (more on that below), so now they’ve tried complaining to the Washington Post, which has syndicated our content since 2008. The Washington Post stood firm beside us today and kept our original post as written. Good for them. Essentially Video Professor is arguing that they didn’t have the chance to respond to our post before we published, and that in general we aren’t behaving very journalistically. One of my favorite habits of journalists is that they refuse to state an opinion. Instead, they find a source to say whatever it is they want said and then quote them. And when I say “favorite,” what I really mean is that I hate it. The story the journalist writes has the look of objectivity but really it’s just the same as if the journalist wrote what she or he meant, directly, in the first place. A gold star journalist will then find a “balancing” quote from someone else, often the person or entity being attacked. “When did you stop beating your wife,” etc. I prefer to just skip all that nonsense and get right to the meat of a matter. And most of my favorite bloggers do the same. None of us have the audacity to think that we are your only news source. You can find other opinions elsewhere, and judge them on their merits, too. Video Professor was a side note in our original Scamville post, just one of a bunch of scams that were making their way into social games on Facebook and MySpace. But now we’re focused on them like a laser. Video Professor is unlike mobile scams which look to get a relatively small $10 – $20/month subscription on your mobile bill and hope you never notice. They go for the big kill: $190 – $290 charged to your credit card on time. I haven’t found the Video Professor scam on Facebook social games since the Scamville posts, but the site is still live, and there are still lot of links from Google and Facebook (they still advertise directly on Facebook). Needless to say, people who get this stuff either don’t read fine print and are charged, or try to return it. There are hundreds of user complaints about refunds not being paid. 271 complaints to be exact, on RipoffReport alone. I’ve put the purchase flow at the bottom of this post. Remember that this is the least scammy version I’ve found (here’s how they lured people in from Facebook a couple of weeks ago). 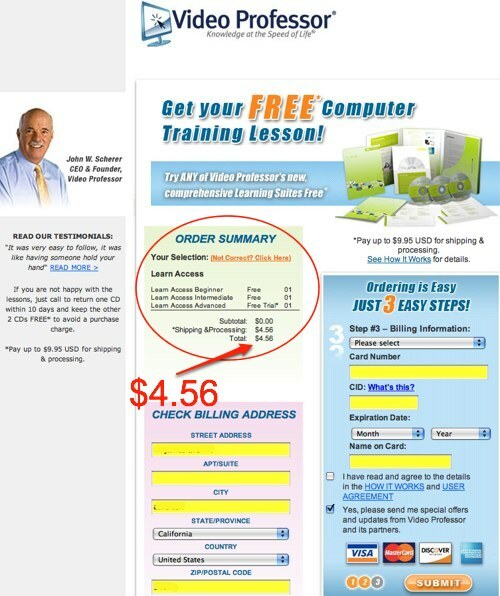 For users who hit the site via Facebook, Google or other advertisments, it’s even scammier. You’re damn right it’s a scam. Users are obviously being tricked into buying something they don’t understand and wouldn’t want even if they did understand the details. The company says they comply with federal and state laws. But they continually refine the landing and checkout pages to comply with the bare minimum of legal requirements while maximizing ROI. Jump to 3:15 of this video for a description of how services like these trick users into buying useless products. Here’s an easy way to determine if something is a scam – would users pay for it if they knew exactly what they were buying? In Video Professor’s case, the answer is no, and the company has to resort to tricking the user into paying nearly $300 for a bunch of CDs. Our governments should be protecting us from this nonsense, but they can’t or won’t. I’ll be damned if I’ll stop writing about it, though. Here’s what people have to say about video professor. See this article and comments, as well as Amazon and epinions reviews. And to the people behind these companies – how do you sleep at night knowing that you are nothing but a deadweight loss to society, taking money from people who aren’t Internet savvy enough to know they’re being scammed? When you’re 80 and look back at what you’ve done with your life, is this really what you want to have spent your time doing? I’m not surprised that Video Professor is going to so much effort to shut me up – this is how they do business. Video Professor has gone after people who’ve criticized the company. Some of the links in this article pointing to other criticisms are now dead links – victims of litigation? In the story, Mr. Arrington accused us of being a “Scam.” Mr. Arrington never contacted us in advance of making this charge for an opportunity to present our side of the story. We contacted Mr. Arrington, and essentially answered the questions he didn’t ask of us prior to writing the story, and it appearing in the online edition of the Washington Post. 1. Is it now the policy of the Washington Post, either in print or online editions to make such assertions, without first contacting someone prior to accusing them of being a Scam? 2. Is it now the policy of the Washington Post, either in print or online editions to have their writers respond to inquiries with the “F” bomb? For the record, and the point we tried to make with Mr. Arrington, we are not a scam. We are members of the BBB with whom we maintain an “A” rating. The BBB reviews all of our marketing materials on a regular basis. We also are in full compliance with all rules and regulations of the FTC. I’d appreciate your thoughts sir and also your time and attention.